Call 1-800-652-5282 for more information on how we can help you increase your coffee sales! We source green coffee beans from every coffee growing country in the world and also offer coffee blends, estate coffees, flavored coffees, regular decaf coffees and Swiss Water Processed decaf coffees, Fair-Trade Organic coffees and espresso coffee. With well over 250 - and growing - flavored coffee choices, each bag of flavored coffee is hand-blended and available in Regular coffee, European Decaf coffee and Swiss Water Processed Decaf coffee. No other roaster offers the number of gourmet flavored coffees that we do. We roast your coffee order in small batches to exacting roast profiles to ensure ultimate freshness. All of our specialty coffees are air cooled and promptly vacuum packed, maintaining the richness, flavor and aroma our customers have come to expect from us. Order today, shipped today; that is freshness you can taste. We are dedicated to be your best and most delicious source of wholesale coffee which is why every bag of KMO coffee has our 100% Unconditional Guarantee. 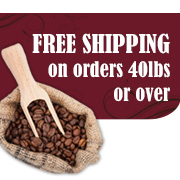 KmoCoffee.com is your go-to source for online wholesale coffee. With well over 250 flavored gourmet coffees to choose from, our selection includes the finest and widest selection of fresh-roasted whole bean coffee in the industry. Coffee blends, estate coffees, decaf coffees, Fair Trade organic coffees, espresso coffee – we offer selections from every coffee-producing country in the world. Your coffee order is prepared in small batches to exacting roast profiles, then air-cooled and promptly vacuum packed. Order today, shipped today; that’s freshness you can taste.